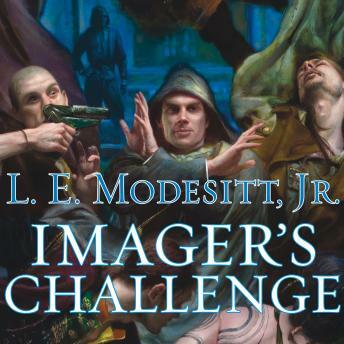 Imager's Challenge takes up immediately after the conclusion of Imager. Still recovering from injuries received in foiling the plots of the Ferran envoy, Rhenn is preparing to take up his new duties as imager liaison to the Civic Patrol of L'Excelsis. No sooner has he assumed his new position than he discovers two things. First, the commander of the Civic Patrol doesn't want a liaison from the infamous Collegium and soon has Rhenn patrolling the streets of the worst district in the city. Second, Rhenn receives formal notice that one of the High Holders, the father of a man Rhenn partly blinded in self-defense, has declared his intention to destroy Rhenn and his family. Rhenn's only allies are the family of the girl he loves, successful merchants with underworld connections. In the end, Rhenn must stand off against gang lords, naval marines, Tiempran terrorist priests, the most powerful High Holder in all of Solidar, and his own Collegium-and find a way to prevail without making further enemies and endangering those he loves.